With so many options on the market, shopping for the best home 3D printers in 2019 can be confusing and time-consuming. Imagine having to go through dozens of products that seem to offer the same features and technical specifications. It can be a nightmare, especially for beginners and non-techies. In this guide, we take a look at entry level 3D printers that are perfect for the home. Good print quality, heated print bed, and easy to upgrade. Manual bed calibration is easy. Dual extruder setup. Auto mesh bed leveling system. Auto skewed axes compensation. This guide aims to streamline the shopping experience for you. We already did the hard work and hunted down the only products that you should seriously consider if you’re looking for a budget 3D printer for home use. 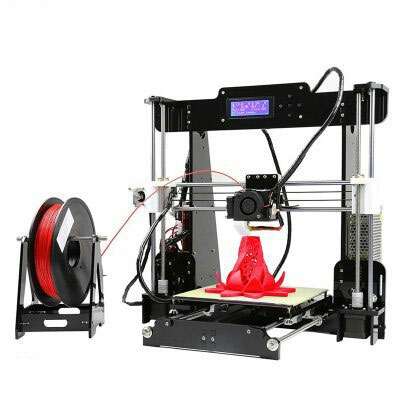 For this guide, we set the price ceiling to $700, removing the Original Prusa i3 MK3 kit, which is considered the best 3D printer under $1,000, from the picture. 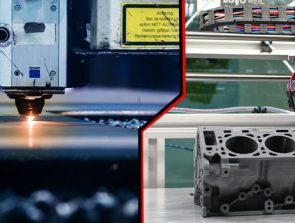 If you can afford the MK3 and are willing to wait months for it to be delivered, then punch in your order now at Prusa Research and forget about this guide. Otherwise, read on. The Original Prusa i3 MK2S is one of the best 3D printers on the market. Even with the MK3 now out, it remains popular among the 3D printing crowd. The MK2S kit, which sells for $600, is the one that fits under our set budget – the pre-assembled MK2S is at $900, so it’s off the menu. It’s easy to assemble the MK2S kit, due in large part to its comprehensive instruction manual. Prusa Research even includes a separate 3D printing handbook, which is neat. It takes around 4-6 hours to put it together. It has automatic mesh bed leveling technology so the initial calibration should be a breeze as well. An open-source 3D printer, the MK2S is a reliable workhorse once tuned-up and optimized. It has excellent print quality and can print with different materials, including ABS, Nylon, and TPU. It comes with a non-removable heated print bed that compensates for cold corners and has a sturdy metal frame with an integrated spool holder and LCD interface. When it comes to support or resources, the MK2S has the best of both worlds: it has a large community and a helpful customer service. The open-framed MK2S is the best 3D printer you can get under $700. It’s reliable and easy to use and produces high-quality prints. This is an excellent 3D printer, but some people might find it too be too expensive for an entry level machine. For our best budget pick, the Monoprice Maker Select v2 gets the nod over the Monoprice Select Mini v2 simply because it has a much larger build volume. It’s more expensive and is less of a plug-and-play 3D printer, but it offers more long-term value. 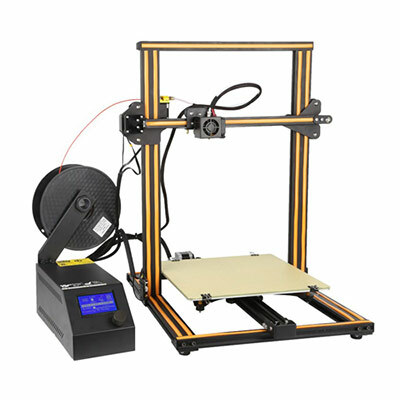 An open-framed 3D printer based on the Prusa i3 design, the Maker Select v2 is semi-assembled out of the box. It takes less than one hour to put it together, with the frame installment being the only major assembly in the process. Unlike the Original Prusa i3 MK2S, the Maker Select v2 absolutely needs mods right off the bat, and the first thing you should do is a MOSFET mod. Although limited to PLA at the onset, the heated bed-equipped Maker Select v2 can print with more advanced materials once upgraded in several areas. It needs an all-metal hotend for high-temperature materials. All the info you need on how to optimize your machine can be found online. Much like the MK2S, the Maker Select v2 has a large community. The Maker Select v2 is a recommended 3D printer for tinkerers. It has a sturdy metal frame with a decent build volume and is easy to upgrade with mods. It comes with a separate controller box with an integrated LCD interface. 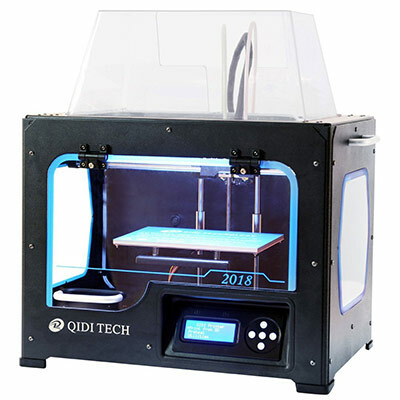 The Qidi Tech I is the only enclosed 3D printer on this list. It’s a clone of the popular FlashForge Creator Pro, which sells for $900. 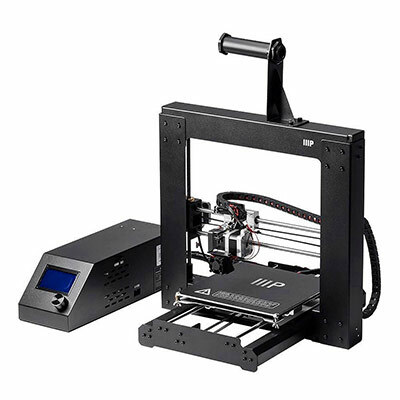 In the Qidi Tech I, you get an enclosed 3D printer with a reliable dual extruder setup for just $650. This budget 3D printer looks a lot like the Creator Pro. It has a robust metal frame with a pair of spool holders at the back and an LCD interface out front. Like with the Monoprice Maker Select v2, you need to assemble some parts at the onset. Installing the extruders, spool holders, and acrylic covers shouldn’t take you more than one hour. Inside, the Qidi Tech I has a heated print bed. The build platform is non-removable, though, so it can be difficult to remove finished 3D models. It’s recommended that you replace it with a magnetic build plate, which you can easily buy at online stores. With the right settings and a few upgrades, the Qidi Tech I can be a reliable workhorse capable of printing non-stop for days. Some even use it for commercial purposes, which says a lot about its reliability. It can produce consistent prints with both ABS and PLA and is compatible with different slicers. The Anet A8 is one of the cheapest 3D printers on the market, going for $200 or less at online stores. You can even get it for around $130-150 during a big sale. But there’s a reason for that ridiculously cheap price point, so make sure you understand the ins and outs of this 3D printer. First, the A8 is a DIY kit, which means you need to assemble it from scratch. It doesn’t come with a printed manual, so you need to rely heavily on online resources to get it done. It’s a good thing the A8 has an active community. In all, the assembly should take you at least six hours. If the A8 is your first DIY kit, expect to spend close to 12 hours for the assembly. And second, the A8 needs upgrades out of the box, and none is more important than a MOSFET mod, for safety purposes. Honestly, the Prusa-based A8 is a mess, with poorly managed cables and exposed electronics, so there’s a lot of work waiting for you. But on the bright side, going through all that work will teach you a lot on the ins and outs of open-framed 3D printers. The A8 can be a good 3D printer that produces quality prints – but only after you’ve done a significant amount of adjustments and tweaks. Keep that in mind before you commit to this highly affordable 3D printer. This is the perfect home 3D printer for those willing to do the work to get it running well. If you find the Monoprice Maker Select v2 and the Anet A8 too complicated, the Monoprice Select Mini v2 is the ideal low-cost 3D printer for you. It’s a compact desktop 3D printer that can produce good results despite its limitations. 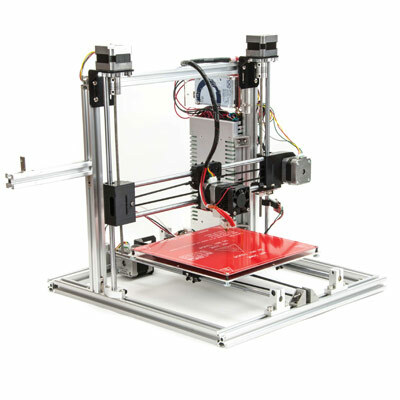 An open-structure 3D printer, the Select Mini v2 is fully assembled out of the box. If not for its tricky and time-consuming bed calibration process, it can be legitimately labeled as a plug-and-play 3D printer. It has a heated print bed, which you probably didn’t expect from such a small machine, and includes a basic knob-operated LCD interface. Like the Maker Select v2, the Select Mini v2 is limited to PLA in its vanilla form. In order to print with high-temperature materials, it needs a few upgrades, such as a more capable extruder and an enclosure. It’s also recommended that you upgrade the print bed for better heat distribution. The Select Mini v2 is one of the best 3D printers that you can get for $200 or less. It has good print quality, comes with a large community, and is easy to upgrade. Its small build size is a bummer, though, but it’s a lot easier to set up than the larger A8, which is also in the same price range. As its name obviously states, the Folger Tech 2020 Prusa i3 is based on the popular Prusa i3 design. But unlike the Anet A8, which is in the same boat, it has an aluminum frame, making it a lot sturdier and more durable. This cheap 3D printer comes in a DIY kit, so it needs to be assembled from scratch. It’s relatively easy to put together compared to other DIY kits, and that’s despite its poorly written instruction manual. In all, the initial setup, which is composed of the assembly and the initial calibration, should take less than 8 hours. 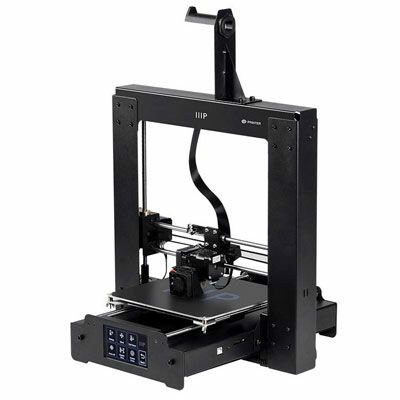 The Folger Tech 2020 Prusa i3 has an open-frame, which is a standard for a Prusa-based 3D printer. It has a decent build volume and comes with a heated print bed. It lacks an integrated LCD interface out of the box, so you need to buy one if you want to print from an SD card. The Folger Tech 2020 Prusa i3 is one of the cheapest aluminum-framed, Prusa-based 3D printers on the market, selling for less than $300. But like most DIY kits, it needs upgrades before it can produce the best results, so you need to be prepared to do some modding. The Maker Farm Pegasus is available in three sizes: 8-inch, 10-inch, and 12-inch. Unsurprisingly, the 8-inch version is the most affordable of the trio, with the basic kit going for just $350. But, depending on the configurations, that figure sails past $400 once you add the extruder and the optional LCD. The varying sizes make it perfect for those who need to fit it under a small desktop in their houses. The Pegasus is similar to the Folger Tech 2020 Prusa i3. It comes in a DIY kit but it’s not too complicated to put together. But unlike Folger Tech, Maker Farm includes a more reliable instruction manual and offers outstanding customer service, so there’s not a lot of guessing involved during the assembly. The Pegasus has a well-built aluminum frame and comes with a heated print bed that heats up fast. Unlike its 12-inch version, the 8-inch Pegasus lacks an LCD interface, so make sure to add one if printing from an SD card is your preferred connectivity option. In fact, there are several things that you need to buy as well, including a power supply and a print surface. If you want a reliable open-structured 3D printer with a tough frame, the Pegasus is a solid option. It’s not as popular as other Prusa-based 3D printers, though, so the community is not that large. 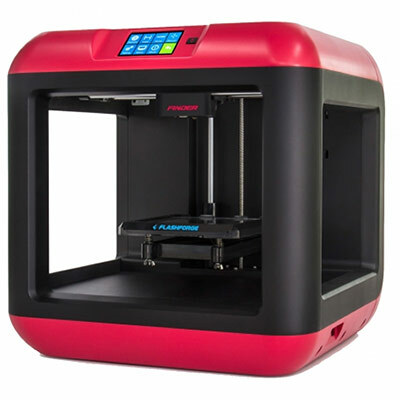 Of all the products listed here, the FlashForge Finder is the most suitable for kids. It’s an easy-to-use 3D printer without a heated print bed, which makes it safe for kids to use, especially in a school setting. The Finder is also a good entry-level 3D printer for beginners who prefer a plug-and-play setup. A semi-enclosed 3D printer with uncovered sides, the Finder is a fully assembled 3D printer. 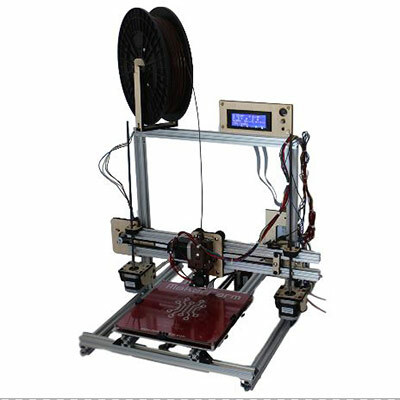 It has an integrated spool holder, which is optimized for FlashForge filaments, and a touchscreen interface. The non-heated print bed is removable so it’s easy to take out completed 3D models off the plate. Setting up the Finder is easy. It takes less than 30 minutes to get it up and running. The print quality is good for a budget 3D printer, but the kind of projects you can take up is fairly limited. With the non-heated print bed, you can’t print with high-temperature materials. And with the small build volume, you can’t print larger, more complex 3D models. If you want a cheap plug-and-play 3D printer as your starter machine, the Finder is a solid option. And once you’re ready to move on to bigger things, you can still keep it as your secondary 3D printer. The Monoprice Maker Select Plus is an upgraded version of the Maker Select v2. It’s got almost the same tech specs, including the build size and the maximum layer thickness, but has several design changes that can make life easier for some users. First of all – and this is the most important – the Maker Select Plus does not need a MOSFET mod out of the box, so you can use it right away without worrying about fire hazards. If you don’t want to mod your machine just 10 minutes after unboxing it, the Maker Select Plus is for you. It’s safe right off the bat. In appearance, the Maker Select Plus has been slightly redesigned. Its electronics are now integrated into the frame, instead of in a separate control box, so it has a smaller footprint and is a lot easier to move around. And instead of an old-school, knob-operated LCD interface, the Maker Select Plus has a touchscreen interface. On the flip side, the Maker Select Plus has a smaller community and is not as popular as the Maker Select v2, which is cheaper. But the good news is that many of the mods for the older model can still be used on the more recent model, and that includes the popular Z-brace mod. So, in the end, it’s a matter of price point versus convenience. It’s still cheaper to get the Maker Select v2 and do the MOSFET mod on your own. But if you prefer a machine that’s safe out of the box and has a smaller footprint and a touchscreen interface, the Maker Select Plus is for you. If you want a cheap 3D printer with a massive build volume, look no further than the Creality CR-10S. It’s the largest 3D printer on this list. It’s even larger than the 12-inch version of the Maker Farm Pegasus. The CR-10S is the upgraded version of the popular CR-10, although when it comes to appearance, the CR-10S doesn’t seem any different from the older model. The CR-10S has the same tech specs as the CR-10. It’s semi-assembled out of the box. It has a robust aluminum frame with good cable management and is accompanied by a separate controller box, which comes with an integrated LCD interface and a spool holder. 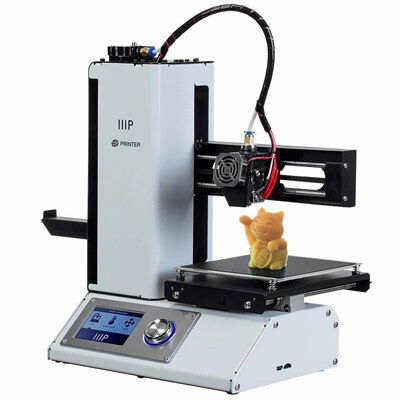 It has a heated print bed and is compatible with third-party filaments and slicers. The CR-10S now has a dual Z-axis lead screw and has an improved mainboard. In addition, it has a filament sensor and the ability to resume from a power loss – both of which will come in handy during large-scale prints, which the CR-10S is obviously built for. Unfortunately, the CR-10S still has some of the issues of the CR-10. The included instruction manual is still crap and the quality control isn’t any better. And as usual, the official customer support is practically non-existent, forcing you to deal with less-than-helpful third-party resellers. Speaking of which, getting your hands on the CR-10S is like walking in a minefield – you have to go through suspicious resellers to get it. There are other large-format 3D printers under $700 – like the Flsun i3 Plus and the Tronxy X5S – but none of them are as reliable as the CR-10S, which, due to its popularity, also has a large community. If you value a large print area more than anything else, forget about all the other 3D printers listed here and just head straight for the CR-10S. A DIY 3D printer needs to be assembled from scratch, which can take at least 3-4 hours, with the more complicated ones taking anywhere between 6-12 hours. Some DIY kits can even take several days to assemble, especially if the instruction manual is garbage. Most people don’t recommend DIY kits to beginners because they can be a pain to deal with. But on the bright side, assembling a 3D printer from scratch is a valuable experience. Getting acquainted with the parts and knowing what makes your machine tick will prove useful when you encounter hardware issues in the future. A pre-assembled 3D printer, on the other hand, is exactly what it sounds like: a machine that comes assembled and ready to go right out of the box. However, not all products advertised as pre-assembled are like that. There are also semi-assembled 3D printers that require some assembly at the onset – but not on the same scale as DIY kits. The Creality CR-10S is a prime example of a semi-assembled 3D printer. While most of its parts are already bolted and secured in place, you still need to put the frames together. One of our top three picks here, the Qidi Tech I, is another good example. Its metal frame is fully assembled out of the box, but you have to install a few parts – such as the extruders, spool holders, and acrylic covers – on your own. Semi-assembled 3D printers are a lot easier to assemble than DIY kits, though. Just an hour or two should get it done. Pre-assembled and semi-assembled 3D printers offer convenience and are recommended for casuals and non-tinkerers and those who simply don’t have the time and patience to deal with DIY kits. It’s easy to distinguish an open-structure or open-frame 3D printer from an enclosed 3D printer. You can tell just by looking at promotional images. There’s no need to go into the listed specs. The Original Prusa i3 MK2S is an example of the former while the Qidi Tech I is an example of the latter. Both types have pros and cons, so it’s more than just choosing which one is the most aesthetically pleasing. An open-frame 3D printer is easier to upgrade with mods and usually has a more generous build volume, with the option to add even more space through extensive modifications. But due to its exposed design, an open-frame 3D printer is often noisier and is unprotected from dust and other particles as well as curious hands that shouldn’t be anywhere near the heated components. DIY kits are in this category. 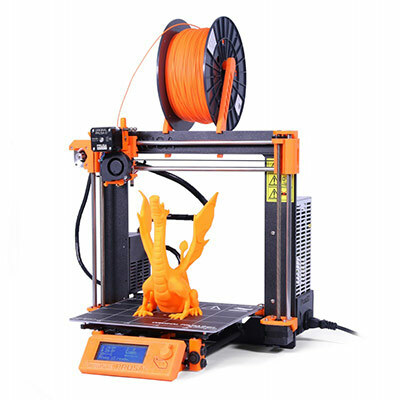 An enclosed 3D printer, meanwhile, provides better stability during prints, although there are also open-frame 3D printers that come with an exceptionally rigid frame and are more stable than others – like the LulzBot TAZ 6 and the Maker Farm Pegasus. Due to its covered design, an enclosed 3D printer is relatively quieter and is more protected against dust and stray hands. This is especially helpful if you are running your printer at home during the night with larger and more complex prints. But enclosed 3D printers are also known for their more limited build volumes. Although there are a few that do offer a large build size – like the Raise3D N2 and the Zortrax M300 – such products are often on the expensive side. Most importantly, an enclosed 3D printer is a lot better at maintaining consistent temperatures in the print area, which is crucial when printing with high-temperature materials like ABS. Also, the enclosure protects you from fumes in case you prefer to have your 3D printer in your bedroom. On the not-so-bright side, an enclosed 3D printer is not as open to modifications as open-frame 3D printers, not to mention the enclosure can make it more difficult to do repairs inside the frame. However, an open-frame 3D printer can also have the benefits that an enclosed 3D printer has by default. If you want to print with high-temperature materials on your open-frame 3D printer, you can buy or build your own enclosure. And if you want more stability during prints, you can modify your machine and add frame braces. In the end, your choice depends on your budget. Open-frame 3D printers are often cheaper. 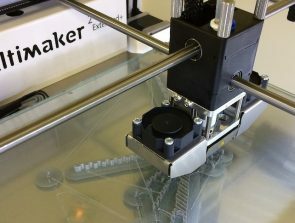 Although there are a number of cheap enclosed 3D printers on the market, most of them are either unreliable or too limited – or both. That’s why there’s only one such 3D printer listed here in our guide to the best cheap 3D printers. This one should be fairly easy. If you want to print with two colors without having to pause the print in order to change the filament and/or print more complex models that need water-soluble supports, go for a dual extruder 3D printer. If not, then a single extruder 3D printer is fine. There are also products with an independent dual extruder system – like the BCN3D Sigmax and the MakerGear M3-ID – where the extruders move independently from each other. With that kind of setup, you can print two copies of the same 3D model at the same time, boosting your productivity. Sadly, such products are expensive. The MakerGear M3-ID, for example, retails for a whopping $3,000. A dual extruder 3D printer can be difficult to deal with, though, especially the budget ones. So if you’re new to 3D printing, just go for a single extruder setup. If you get an open-frame 3D printer with a single extruder, you can always upgrade it to a dual extruder setup in the future, when you’re more experienced and can confidently deal with potential problems. A non-heated print bed is good enough for PLA, though you may need to do a few tweaks, like applying glue on the build plate, in order to up your success rate. But there’s only one legit reason you should go for a 3D printer with a non-heated print bed: safety. If you’re going to buy one for a kid, a 3D printer with a non-heated print bed is the safer choice. Because you know how kids can be when around things that invite curiosity. With a heated print bed, the print quality gets a huge boost. First, a heated build plate helps with the first layer’s adhesion – a botched-up first layer can immediately spell disaster. Most materials will stick more on a warm surface than on a cold one. Not all heated build plates come with the same quality, though. Most products still require artificial adhesives to ensure that prints stick. Second, a heated build plate reduces warping. Simply put, warping occurs when a layer cools down before the next layer is deposited. And like with a messy first layer, it can also lead to disastrous results. The entire model doesn’t have to be in a hot state during the entire print, though, because that would cause the lower layers to get saggy as more weight is added. Basically, a heated build plate prevents the extruded material from cooling down too fast. If you want to print with ABS and other high-temperature materials, definitely go for a 3D printer with a heated print bed. Even if you only plan to print with PLA, it’s still recommended that go that route – unless, as mentioned, you want a safer machine for kids to use. In the beginning, a 3D printer’s build volume probably won’t matter much to you because you just want to print things, regardless of their size or shape or color. But as you learn more about 3D printing and become more familiar with what your machine is capable of, you will want to move on to bigger things – literally. The good news is that you have lots of options in the budget territory. There are 3D printers that have small build volumes like the FlashForge Finder and the XYZprinting da Vinci Jr. 1.0. There are large-format 3D printers like the Creality CR-10S and the Tevo Tornado. And then there are the Prusa i3 clones, which come with decent build volumes. If you want a portable desktop 3D printer that fits easily on your cluttered work desk, get a small-scale 3D printer like the Monoprice Select Mini v2. But if you want a more future-proof 3D printer that can accommodate larger 3D models once you’re ready to experiment with them, buy a 3D printer with a more generous build volume. Not all 3D printers boast the same set of features. In general, the more expensive the product, the more features it has. Of course, there are a number of exceptions from both sides of the fence. There are cheap products that come with several features normally found in high-end 3D printers. And then there are expensive 3D printers that don’t hold a candle to some budget 3D printers when it comes to features. Here’s a rundown of some of the features 3D printers come with, listed in no particular order: automatic bed leveling technology, a power panic function, a filament sensor, Wi-Fi connectivity, a removable magnetic build plate, a laser engraver, a touchscreen interface, and an onboard camera for remote monitoring. Some 3D printers come with almost all of those features while others have none of them. It’s unfair to judge a 3D printer based on its number of features alone. For example, two of our top picks here – the Monoprice Maker Select v2 and the Qidi Tech I – are not exactly what you’d call “feature-rich.” But despite that, they are still highly regarded because they offer more overall value than some of the more expensive products that have lots of features. It’s cool to look for a 3D printer with convenient features that can make your life easier – like automatic bed leveling technology, for one. But don’t let that preference blind you from seeing the 3D printers that offer more overall quality and long-term value. After all, humans tend to get easily distracted by flashy things. Most of the 3D printers on the market can start prints via a USB cable and/or an SD card. Lots of people prefer the latter because it doesn’t require a computer to be running throughout the entire print. With an SD card, all you need to do is transfer the file into it and then load it from the 3D printer’s integrated LCD interface. A USB-based print is self-explanatory. 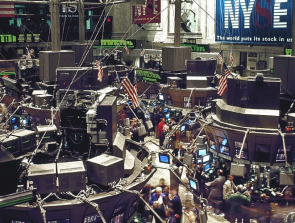 When it comes to reliability, both connectivity options have been known to produce mixed results. It depends on the 3D printer. Some products encounter a lot of reading errors when printing from an SD card while others run into more problems when connected via USB. But there are also those that have had little to no issues with both. There aren’t many entry-level 3D printers that offer a Wi-Fi connection. And the ones do, like the FlashForge Finder, are often unreliable in that regard, so don’t get your hopes too high up. The good news is that you can modify your 3D printer and add a Wi-Fi control that would allow you to start prints and monitor your print progress from a distance, with or without an onboard camera. Some people are not all that interested in the tech specs and are more concerned about the community behind a 3D printer. Take the Creality CR-10S, for example. Except for its massive build volume, its official tech specs and features don’t really jump out of the page. But a lot of people, including beginners, are drawn to it because it has a large online community. Having an active community – it can be on Facebook, Reddit, Google Groups, or some other platform – is a huge plus for a 3D printer. If a 3D printer has an active community, there’s a good chance that most – if not all – of the problems you will encounter have already been solved or at least identified by other users. In addition to that, you can find guides that teach you how to optimize and get the most out of your machine, including mod guides. Obviously, it’s great if there’s existing official support as well. Sadly, cheap 3D printers are usually lacking in that department. But there are some companies that do provide outstanding customer support – like Qidi Tech and Maker Farm.